We have investigated the dynamics of photoinduced bimolecular electron transfer in solvents of various viscosities using ultrafast spectroscopy. This study was motivated by numerous recent reports of the observation of the Marcus inverted region in micelles and room-temperature ionic liquids (RTILs), and of electron transfer rate constants much faster than diffusion in RTILs, based on stationary or 'slow' time-resolved measurements. 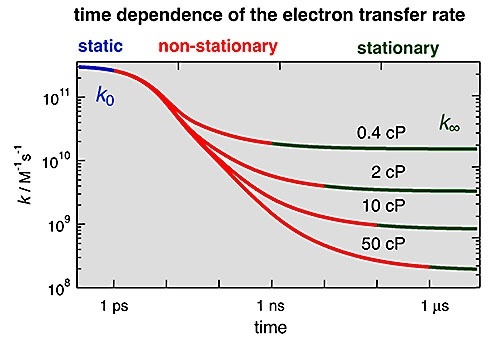 Using ultrafast spectroscopy, we could evidence that the electron transfer process takes entirely place during the static and non-equilibrium stages of the quenching and that the extraction of the electron transfer rates, k0 and (see figure 1), requires the use of advanced theoretical models of diffusion-assisted reactions. Our results show that electron transfer in RTILs is not faster than in dipolar solvents of the same viscosity (figure 2). Moreover, the electron transfer rate constant increases with the driving force and thus does not exhibit an inverted region. Both reported unusual effects are in fact due to a total neglect of the time-dependence of the electron transfer rate, that require high time-resolution to be observed and adequate models to be analysed. Figure 1: effect of the solvent viscosity on the time dependence of the bimolecular electron transfer rate. 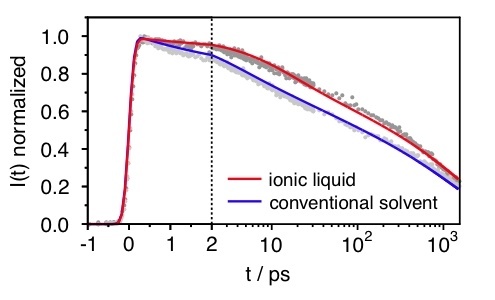 Figure 2: decays of the excited state population of the reactant upon electron transfer reaction in a room-temperature ionic liquid and in a conventional dipolar solvent of the same viscosity measured by femtosecond fluorescence up-conversion. Bimolecular photoinduced electron transfer reactions still lack a thorough understanding, with the absence of the Marcus inverted region and the quasi-irreversibility at low driving forces constituting only two prominent enigmas. The current vast arsenal of ultrafast experiments allows for a systematic study of all these processes not only in a comprehensive way but also with unprecedented precision. Thanks to the help of the Hamm group at the University of Zürich, we are now able to perform femtosecond Vis-pump IR-probe measurement, and have access to the structure of the intermediates involved in these processes. We hope to obtain complementary information by probing these reactions in the THz regime, in collaboration with the Moser group at the EPFL. Additionally, “computational experiments” allow for putting the theoretical models, mostly based on macroscopic observables, to a test. Therefore, we have started collaborating with the Meuwly group at the University of Basel to perform molecular dynamics simulations. We showed that all these observations of inverted region for bimolecular photoinduced electron transfer reactions are spurious. Therefore, despite 40 years of effort, there is still no convincing report of an inverted region for this type of reactions. The origin of this unusual behaviour compared to other electron transfer processes is still unknown. In view of the important applications where these reactions are involved, solving this problem remains a major issue. M. Koch, A. Rosspeintner, G. Angulo, E. Vauthey (2012) Bimolecular Photoinduced Electron Transfer in Imidazolium-Based Room-Temperature Ionic Liquids Is Not Faster than in Conventional Solvents J. Am. Chem. Soc. 2012, 134, 3729 - 3736. A. Rosspeintner, M. Koch, G. Angulo, E. Vauthey (2012) Spurious Observation of the Marcus Inverted Region in Bimolecular Photoinduced Electron Transfer. J. Am. Chem. Soc. 2012, 134, 11396-11399.